John Player established a company selling agricultural fertilizers. It was highly successful company and in 1877 Player decided to use some of the profits to buy a tobacco company. John Player died in 1884 and the management of the company passed to his two sons. 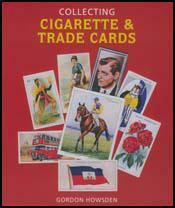 John Player & Sons published its first cigarette cards in 1893 (Castles and Abbeys in the United Kingdom). Its first set of football cards appeared in 1926. It was a series of caricatures by "Rip" (R. P. Hill). Another series, this time illustrated by "Mac" (Douglas Machin) appeared in September, 1927 and featured players like Jimmy Ruffell and Dixie Dean. Sets of these can be obtained from dealers for around £65. In October 1928 John Player and Sons produced a series of 50 illustrated action cards. This was followed by another 25 in February, 1929. The first series included David Jack, Sam Cowan, Tom McDonald and Stanley Earle. In September, 1934, John Player and Sons produced a series entitled Hints on Association Football. It included advice on defensive and attacking throw-ins, back passes, free kicks, triangular wing movement, bringing the ball down, heading, passing, corner-kicks, trapping the ball, etc.